J.R.R. 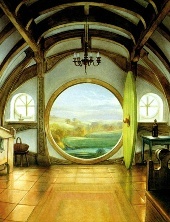 Tolkien wrote The Hobbit for his own children and it has delighted children of all ages since its publication in 1937. The story tells of the adventures of the hobbit Bilbo Baggins, who is whisked away by the wizard Gandalf and a group of Dwarves led by Thorin Oakenshield. Along the way to the Lonely Mountain, Bilbo encounters trolls, goblins and Elves, all for the sake of recapturing the Dwarf treasure which lies beneath the mountain and is guarded by the dragon Smaug. More importantly, Bilbo finds a magic ring during his adventure, which is to change his life, and the course of the history of the peoples of Middle-earth. A Short Rest: On their journey, Bilbo Gandalf and the Dwarves arrive at the Last Homely House. There they meet the master of the house, Elrond, and dwell briefly in the fair valley of Rivendell. Riddles in the Dark: Deep beneath the Misty Mountains, Bilbo comes across a strange creature named Gollum and makes away with the creature's "precious" magic Ring. Book review by Riv Res. © 1966 by J.R.R. Tolkien. Images © John Howe.